The Farm at Mill Creek rendering. Image courtesy of City of Mill Creek. By Joni Kirk, Mill Creek Director of Marketing and Communications. 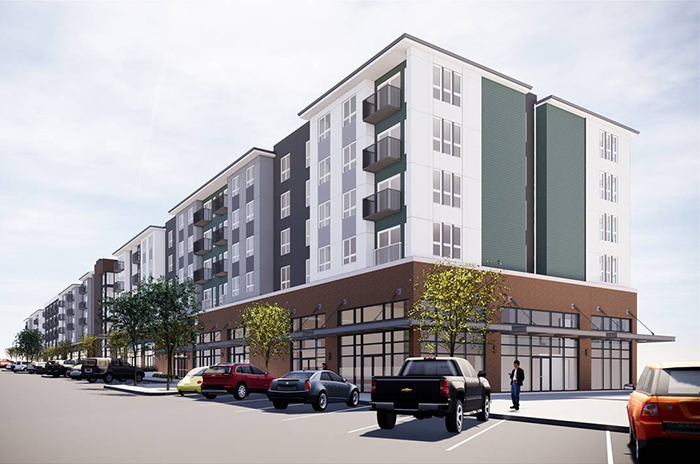 A proposed multi-use project in northeastern Mill Creek took another step forward this week with the approval of the development agreement by the Mill Creek City Council on March 26, 2019. The development agreement is based on the city’s regulations that were created in 2008 and modified in 2012. The city council received comments from the community during a public hearing at its March 26th Council meeting. The development agreement goes above and beyond meeting city zoning regulations. A public gathering area and plazas at the development that can be used for city events. The review process for the proposed development has several additional steps. First is the City issuance of a State Environmental Policy Act (SEPA) determination, which ensures that environmental values were considered, and that impacts to the built and natural environment were evaluated. Following the issuance of the city's SEPA threshold determination, a public hearing will be scheduled to review the binding site plan. This hearing will be conducted by the city’s neutral hearing examiner. The hearing will be advertised 10 days in advance of the date it is held, during which time the public can submit comments to the hearing examiner for consideration. Further, the public may provide written and oral comments and feedback at the hearing. If the hearing examiner approves the project, it will move forward with the city's design review, permitting, and other building processes. Additional information about the project is online at www.cityofmillcreek.com/thefarm.